1. One to two days before re-potting, water the plant well - the roots can actually break off if you remove the plant when the soil is dry. Ask the sales person at the nursery which potting soil is best for your plant, since it may require a special blend. choose a new terra cotta or ceramic pot that is 2" larger in diameter than the current one. This isn't the time to be modest. Get a nice planter that is large enough so your don't find yourself re-planting the same plant next season. 2. If your pot does not have drainage holes, carefully drill two or three in the bottom using a power drill. Place a coffee filter in the bottom of the pot, covering the holes, to keep the soil from washing out while still allowing water to drain. Fill the container with a couple of inches of soil. Better yet, us the Pot filler that we sell at Arizona Pottery. It is made of recycled materials, lets excess water out and keeps soil in place. Click here for more information. 3. 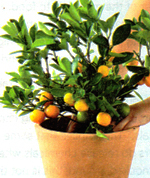 Turn the potted plant upside down, holding one hand on the pot's bottom and the other palm on the soil with the plant stem between your fingers. Pull off the pot while wiggling the plant down into your hand. Check the roots; if they look tightly wound or are growing in a circular pattern, gently loosen them. Clip black roots, which may be rotten. 4. Place the plant in the middle of the new container and check to see that the soil line will be about 1" below the pot rim. 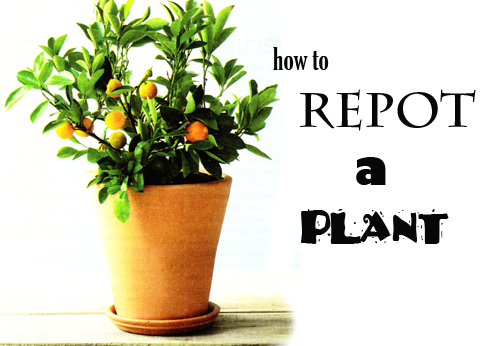 If the plant is sitting too low, pull it out and add more soil to the bottom until you get the correct level. 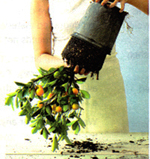 Add soil to the sides to fill, gently patting as you go, until the soil reaches the plant's existing soil line. Water well.